I just finished watching the first episode of Dragonball Kai with my roommate. It was very… strange. It was nostalgic in many ways, but somehow, it also felt like a completely new experience. Dragonball Z, along with Sailor Moon, was one of the first series that really propelled me into anime on the whole. It wasn’t the first anime I’d seen or the first I’d loved (those would be My Neighbor Totoro and Zettai Muteki Raijin-Oh), but I’m sure that I’m not the only one to have ever-sweet memories of coming home from school every day with Toonami to look forward to. I haven’t rewatched DBZ since it ended its initial run on the block years and years ago, and I never did dig up the Japanese original to take a gander at either. In reality, it really hasn’t been that many years. DBZ’s original dub run ended in April 2003. Six years. That’s not that long… right? November 6, 2008 • News • Comments Off on More Dragonball: Oh, GOD, what is THAT?! If that’s Goku’s oozaru form, I think I’m gonna cry. Okay, okay, so they say that it may not be a final shot, but if Fox requested that it be taken down, then it must be official in some way shape or form, right? Or they might just want the general bad impressions of the movie to slow their rampant circulation. Still… this screenshot makes Goku look more like a creepy lizard than a gorilla. I always wanna say this would have made a better Piccolo, but it wouldn’t really. I can live with Nosferatu!Piccolo all right enough. What, two posts in one day? What is this madness?? A lot’s happened since I last talked about the upcoming Dragonball movie. Piccolo’s makeup job was revealed. Other people’s pictures were revealed. And oh, this trailer leaked sometime last week. Watching the trailer is a pretty sobering experience. The trailer outlines a movie that could be pretty much any other Hollywood movie — kung-fu masters are all the rage these days, and so are key words like “true” and “prophecy.” All of the shots and angles and colors and effects seemed so plain, so familiar, so overdone. Very little of it was reminiscent of the source material, and really, if it wasn’t for the kind-of-recognizable dragonballs themselves, it could be any other movie. 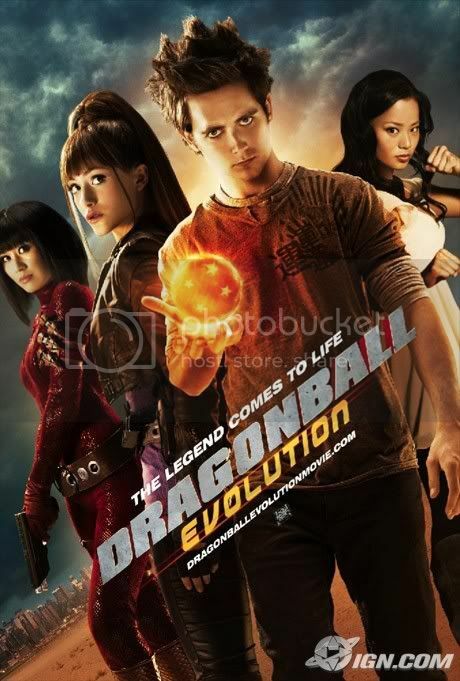 I wouldn’t have known better if it hadn’t been labeled as the Dragonball movie. The “prophecy” thing bothered me a lot too… it’s just such a generic and over-used word that’s been used over and over again in dozens of other films. That they used it to present Dragonball is disappointing. It’s been obvious for a while that they’re trying to capture something bigger than the niche audience. It wasn’t for the fans that they aged Goku up from a spunky, little Asian kid to a mid-twenties white dude. It wasn’t for the fans that they made Piccolo look like Nosferatu. Yeah, both Goku and Piccolo are technically aliens without nationality, but those are the little things that fan want to count on. Our Son Goku is one of a million incarnations of the character from Journey to the West; as such, he should remind us of a mischievous little monkey king. July 24, 2008 • Editorial • Comments Off on The Next Big Thing — Live Action Anime? With three ridiculously popular Death Note and the NANA live actions still in recent memory, it seems like everyone and their mom is making live action adaptations of anime, including some by American companies. The Dragonball movie’s finally got a confirmed release date in 2009, and Fox has just confirmed having acquired the rights to a Cowboy Bebop live action, not to mention that there are rumors floating around about an American adaptation of Death Note (do we really need more? ), though I’ve forgotten where I read this. As well, both TOKYOPOP and Viz have recently restructured to include a new media branch that will supposedly focus on pitching properties to Hollywood. I find all of this somewhat surprising considering Speed Racer’s abysmal failure (though I don’t think it really deserved to bomb as badly as it did), but I’m curious — if even one of these live actions manages a mild success in the US, could that open the gates for many, many more, just as 2000’s X-Men and 2002’s Spider-Man seemed to have opened the floodgates for endless comic book adaptations? So they finally gave us a poster with Goku on it. I can’t decide whether or not I’m excited about this movie. I’ll probably go see it regardless, and I had renewed faith when they announced that Stephen Chow would be involved. But they’re still using a white guy as Goku. ._. To be fair, I don’t remember any of his other roles well, and thus can’t judge him much as an actor, but it just seems weird? Orange gi sure looks weird in real life — isn’t it funny how we never realize these things? I hope they never make a live action Naruto, but if this movie’s even a minor success, it wouldn’t be all that surprising if someone tried to do the same with DBZ’s grand successor. I can’t remember, are they planning sequels for this Dragonball movie? Anyway, I’m glad they finally have a date on this after kicking around in the rumor bin for years after years.